Big weekend. "Argo" opens and "The Other Dream Team" opens (two of my most anticipated fall/winter films!). "Seven Psychopaths" opens. The race to Best Actor begins with Kevin James and "Here Comes The Boom." (Ha ha! Kidding!) "Hotel Noir" and my Official Cinematic Crush hits On Demand. And, of course, the Chicago Film Festival makes first contact. Black Pond. An English mockumentary centered around a family accused of murder. Flowerbuds. Life in a small Czech town. Reeled in four Czech Lions. Gimme the Loot. Two young graffiti writers on the mean streets of NYC. Sister. A Swiss twelve year old complicates his sister in his schemes to rip off tourists at a luxury ski resort. Tchoupitoulas. Ryan McNeil of The Matinee wrote glowingly of this documentary when he saw it at Hot Docs and I immediately made a mental note of it. Lucky me it came to CIFF! King Curling. Cinema Romantico's #1 Must See Film At The 2012 Chicago Film Festival! A curling movie. Yes. A curling movie. 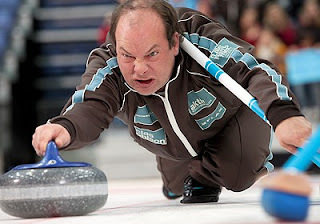 If you didn't know, curling is my 2nd Favorite Sport (after college football). Will yet another Norwegian film steal at my heart? Did you see "Hotel Noir" yet? I want to see it as I'm a big fan of Rufus Sewell. I've been enjoying TCFF myself, saw three really good movies, my two faves happens to be music-themed for some reason, esp. The Sapphires. I actually watched it last night. And I have to admit, I was little disappointed. Though I kind of thought that might happen. I saw another one of the director's films a couple weeks back and didn't think so highly of it. Rufus Sewell is pretty good, though. I was hoping you'd track down Beyond the Hills at the CIFF. I love 4 Months, 3 Weeks and 2 Days, and I want to see what else that guy's got up his sleeve. Yeah, every year during CIFF I have other things going on at the same time and so I always end up having to pick and choose depending on when I have the time. So that one didn't make the list. But, you never know. I often end up making audibles, so it could still happen.